Jake was in like a flash, correctly identifying that the bone was a humerus – not an easy thing to spot considering the very strong curve and the deep groove at the head end. 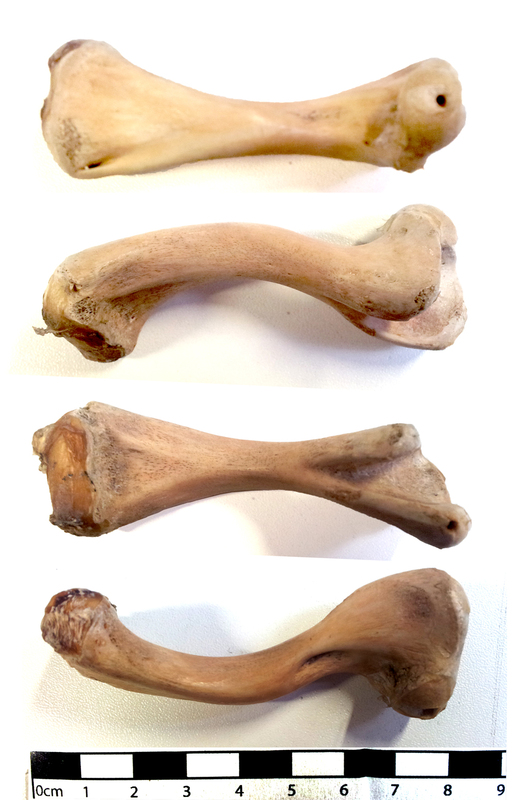 Jake also noticed that the humerus was adapted for something unusual, hence the weird shape. There was a suggestion of pig by henstridgesj, which would have fitted the curve of the bone, but it was too small and the deep groove is at the wrong end. Newcomer to the mystery object, Rute Branco, suggested that the object was the humerus of a (young) tortoise – a suggestion that I agree with (as does Daniella). Tortoises have weird legs that need to carry quite a lot of weight, thanks to their bony carapace. They also need to get their legs inside their shell, so they have to be shaped for efficient retraction. One of the differences between a terrestrial tortoise and an aquatic turtle humerus is the shape of the groove in the head, with terrestrial tortoises having a very steep and deep groove while swimming turtles have a slightly shallower and wider groove to allow a wider range of movement. I can’t find enough comparative material to work out a species, or even genus of tortoise for this specimen, but I will keep my eyes peeled! Thanks for everyone’s input.